Sometimes the better stories take a little longer to write. A few months ago, I had a day off from work so I decided to visit a wine shop that I've heard good things about but haven't been to in a couple years. 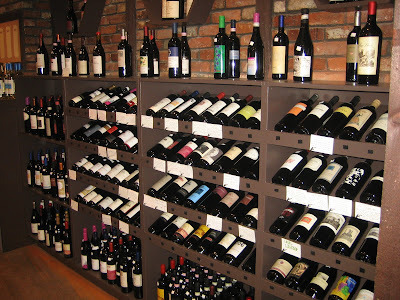 The store: The Wine Bottega in Boston's North End. The Wine Bottega was recently award Boston Magazine's highly regarded Best of Boston award in the Wine Shop category for 2009 beating out some formidable competition. In many ways, the Massachusetts wine market is a bit of an island unto itself with arcane legislation that prohibits open market competition on a number of levels. On the other hand, we're fortunate to have shops like The Wine Bottega that offer a high level of service and education to area wine enthusiasts. The day I stopped in, owner Kerri Platt happened to be in and invited me to sit in and taste along through 24 wines that wholesaler Jeff Slavin from Hangtime Wine Company was pouring for their consideration. What an opportunity to try outstanding wines from all over Italy. Kerri (formerly of Lower Falls Wine Co. in Newton, MA and Bare Cove Wine Annex in Hingham, MA) along with Matthew Mollo and Michael Dupuy made me feel right at home as we tasted through some good/very good Friuli, Super Tuscans and Nebbiolo d'Albas. They've got a way of being informative and educational without being preachy which I really appreciated. But when we got to the wines from Barbaresco I was *really* impressed. These wines had unique aromas I'd not experienced in others previously: Rose petals, tar and dark red fruit. Somehow these wines were, to me, dramatically different from Barolos I'd tasted (even though the two regions are within just a few miles of each other and both made from the Nebbiolo grape). The Barbareschi were medium bodied but very full of flavor. I was stunned by two wines in particular from Cigliuti- their 2004 Vigne Erte Barbaresco and to an even greater extent their 2004 Serraboella Barbaresco. The shop doesn't focus exclusively on Italian wine, nor do they ignore every-day drinking wines. All of their selections are thoughtful and hand-picked. It's the kind of place where you can ask them to select 6 wines to help you explore a region you're interested in and they'll pick an assortment of varietally correct examples that give you a good sense of what to expect from that category. They offer free tastings every Friday night from 5-8PM and have a regular schedule of focused tasting events. 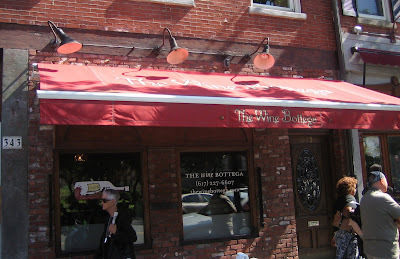 The Wine Bottega is located on Hanover Street in the heart of Boston's North End- home to unique Italian restaurants like Giaccomo's, Lucca and others. Not far from Bill Clinton's favorite spot (or so I've heard) for cannolis: Mike's Pastry. Parking is some of the tightest in the Boston area, but they validate and offer curbside pick-up! Have you been to The Wine Bottega? If so, what did you think?